In the world of mail servers, there are many software and technologies. Here is a list of 3 of them that you must know. Most mail servers made of Mail delivery agent (MDA) and Mail Transfer Agents (MTA). MDA software used to routes e-mail to its destination. You use MDA such as Dovecot, Qpopper, Courier, and Cyrus IMAP/POP3 servers. MTA software used to transfers e-mail between servers or computers. You use MTA such as Exim, Qmail, Sendmail, OpenSMTPD, Postfix, and others. Apart from MTA and MDA, you need to install and use Antispam, Antivirus, Webmail and other software too. You need to make sure your IP address stay clean. Apart from mail server software configuration, you need to install some database to store user names, email IDs, password and other information. Setting up and maintaining a full-fledged email server is a complicated task. You need to be a technology expert and a good sysadmin to set it up. Mail-in-a-Box lets you become your own mail service provider in a few easy steps. It’s sort of like making your own gmail, but one you control from top to bottom. Technically, Mail-in-a-Box turns a fresh cloud computer into a working mail server. But you don’t need to be a technology expert to set it up. It implements modern mail protocols (SPF, DKIM, and DMARC) and the latest security best practices, including opportunistic TLS, strong ciphers, and HSTS. When enabled, DNSSEC (with DANE TLSA) provides a higher level of protection against active attacks. Exchange ActiveSync is also available as a beta feature. 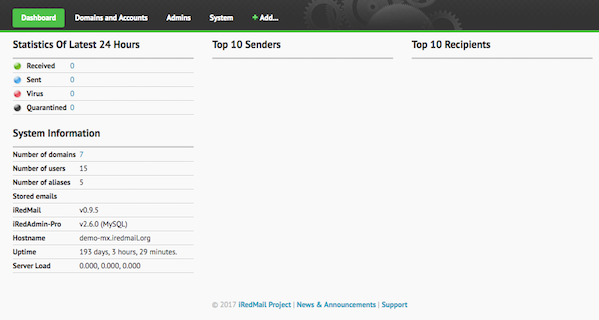 The right way to build your mail server with open source softwares. It Works on Linux and *BSD family of operating system. 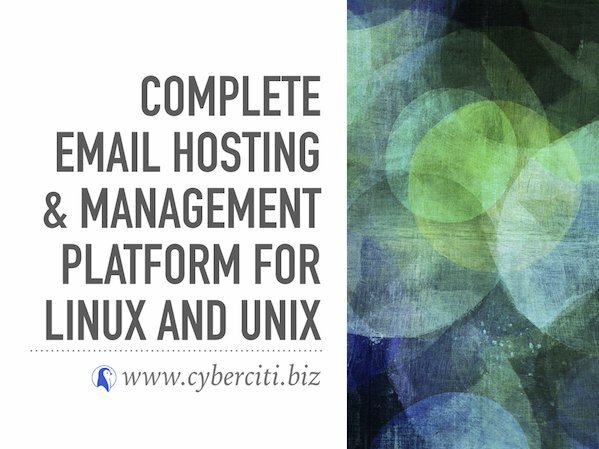 You can setup mail server in several minutes. End users are forced to use mail services through secure connections (POP3/IMAP/SMTP over TLS, webmail with HTTPS). Emails are encrypted in transit using TLS if possible. Passwords are stored in SSHA512 or BCRYPT (BSD). 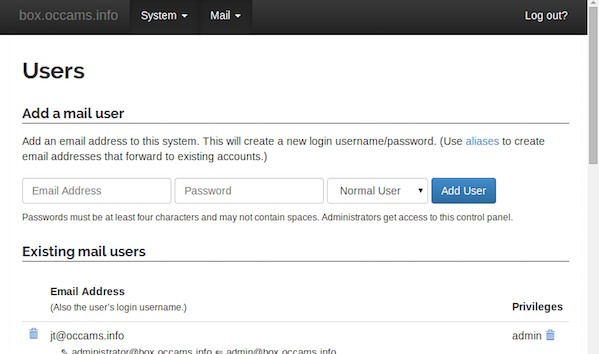 Modoboa is a mail hosting and management platform including a modern and simplified Web User Interface. It provides useful components such as an administration panel or a webmail. 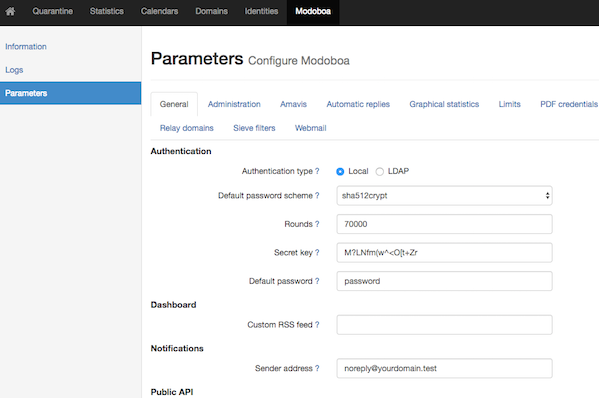 Modoboa integrates with well known software such as Postfix or Dovecot. A SQL database (MySQL, PostgreSQL or SQLite) is used as a central point of communication between all components. It is written in Python and uses the Django, jQuery and Bootstrap frameworks. We also have Nethserver as well as Kolab. Next post: Next post: sudo apt-get install car? Would you?